One day sale going on at Amazon with the Waring Pro Electric Indoor Grill and Griddle. List price of $169 but the current discount has it at $79 plus free shipping. Available in red as shown above but you can also buy a platinum Waring griddle or a black Waring griddle for the same 79$ price. This sale will only last for today as it is normally well over $100. Buy Cuisinart GR-4 griddle and you will see these two products are very similar. Remember, Cuisinart and Waring are both owned by Conair. Thus it should be no surprise that these grills are very similar in almost every way other than the Waring having just one dial (for temperature control) and a price tag that is not as hefty as the Cuisinart Gr-4. 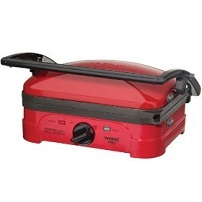 Great value for a versatile grill that can panini-press and act as a grill or griddle. Not the active deal but yes it is still a good purchase.